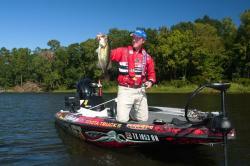 What Is Roller Coaster Jig Fishing? Steve caught this nice bass on a jig. Like a lot of anglers, I grew up fishing bass jigs traditionally, pounding cover with an endless drop-lift-drop-lift routine. And while I caught fish, I didn’t fully grasp how truly versatile jigs are—and how they can be fished in ways that can crack conditioned bass when everything else fails. My “Eureka” moment came on a trip with a saltwater guide who’d throw his jig out as far as he could and rip it back to the boat. Watching him catch fish taught me that we all have preconceived ideas about how we’re supposed to fish jigs. During a TV shoot in Texas a few years back the producers asked me to burn the bait back to boat so they could get a shot of the reel handle rotating. So I start drag racing a jig through two feet of water and all of sudden an 8-pound bass grabs the bait. Here again, I never would have fished a jig that fast, but it produced a solid fish and once again opened my eyes to the efficacy of breaking conventions. Bass are typically released after they are caught, which means a percentage of any bass population has been “conditioned.” Larger fish have seen it all. That’s why fishing new bait designs, colors and techniques are essential to staying ahead of the curve. Like modifying your jig routine to offer bass something different. We’ve been taught to fish the three main jig styles according to head design. For example, traditional round-head designs are usually flipped to cover on heavy braid, while a football head is typically dragged over bottom. The keel head (swim jig) is designed to slither through grass and other cover, usually higher in the water column or even bulging the surface on a steady retrieve. But a round-head jig can also be used as a punch bait to penetrate thick vegetation. Likewise, a football head can be fished on a steady retrieve, even burned back to the boat. The heavy weight typically keeps it down, and in situations like riprap, a football head will bounce from rock to rock like a crankbait. I’ve also used footballs in shallow water, burning them over weed tops like a silent spinnerbait—definitely not the norm. Yet, of all three major jig head designs, the keel head (or swim jig) is probably the most versatile. Case in point, I don’t often fish them with the rod tip close to the water using a slow, steady retrieve. I like to activate the trailer tail by swimming it three or four feet and letting it glide back to the bottom on a semi-taut line, then repeating until the bait is back to the boat. I call it “roller coaster” swimming. The bait spends very little time on the bottom, and this retrieve offers multiple triggering points on every cast—there’s strike potential during the sweep, the drop and the pause. The technique works in channel areas, flats, around stumps, and open areas off emergent vegetation like cattails—and a lot of other areas, too. When you watch what happens underwater, the sweep makes a trailer like a 4-inch PowerBait grub or Havoc Beat Shad paddletail go crazy, then come to an abrupt stop on the pause, then beat again like crazy again on the glide. Get the cadence right it and the presentation seems almost magical. And it’s a lot more fun than the standard jig retrieve. The most crucial component of the ‘roller coaster’ system is fall rate. Head weight, skirt bulk and trailer all factor in. 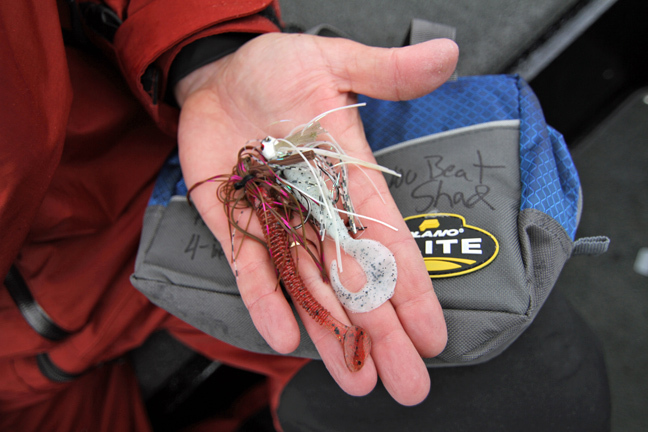 My go-to swim jig head size for shallow water is 3/8-ounce. Go too light and the bait doesn’t fall fast enough; go too heavy and you drag bottom at typical retrieval speeds. However, as bass orient in and around deep weedlines later in the summer you may want to go with a heavier swim jig fished with a slower ‘roller coaster’ retrieve to achieve maximum depth. Another essential component of the ‘roller coaster’ program is the use of fluorocarbon line. I’ll typically fish 12- or 15-pound test, sometimes moving up to 20 if I’m on a body of water with big fish and lots of cover. Fluoro’s slow stretch means excellent sensitivity, solid hooksets and the line’s sinking tendency gives the bait a natural appearance on the retrieve. Fluoro’s near-invisibility under water can be key in shallow, clear waters. Most importantly, fluorocarbon helps keeps jigs near the bottom even at faster retrieves. Next, a properly matched rod and reel can be a huge plus. I fish swim jigs on a fast-action medium heavy seven-foot and a medium-speed, low-profile 7.1:1 ratio baitcaster like the ultra-lightweight Abu Garcia Revo MGX. The reel takes in 28 inches of line for every turn of the reel handle; about the same as other reels geared 6.4:1. Besides using a soft plastic trailer that matches the color of the skirt/jig head and produces a gentle wobble, I’m a big fan of modifying stock weed guards. I like to remove about a third of the bristles to improve my strike-to-hook-up ratio. The addition of rattles is also a good idea at times, especially in more turbid waters. Another thing: A lot of guys will immediately start reeling and let the rod load, letting the fish set the hook. When I get a hit I drop the rod tip and set the hook. My challenge to anglers fishing jigs is to think about how other anglers aren’t fishing them—then experiment with those methods. The ‘roller coaster’ swim jig routine is but one example of the myriad ways you can modify your jig game to catch more fish. Award-winning fisherman/journalist, creator of Knot Wars, formerly with the North American Fishing Club, Steve Pennaz has launched Lake Commandos, a new brand that includes Lake Commando television/social media series on Pursuit Network and TuffTV. 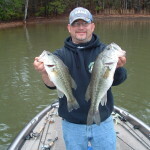 This entry was posted in Bass Fishing, How To Fish on July 31, 2013 by ronniegarrison. It is great to go to full lakes this summer, the first time in several years. But all the rain sure is a mixed blessing. It fills the lakes but fills my yard with mosquitoes and I think it encourages fleas that continue to be a problem. The rain also makes it so humid it is hard to fish during the day. Even when it is not raining I sweat so much I stay wet. And the clouds will fool me every time. I don’t think I need sunscreen until I realize, too late, I am getting blistered. Wednesday I went to Jackson Lake and met Jason Williams to get information for a Georgia Outdoor News article. He got there that morning and fished until he met me at Berry’s Boat Dock at 1:00 PM. I was disappointed when he told me he had caught some small bass but nothing over two pounds, what we needed for pictures. The night before Jason and his partner had come in second in the Tuesday night Berrys tournament. They had 7.5 pounds and it took only nine pounds to win. That is a low weight for one of their tournaments and shows how tough fishing is right now. Jason showed me ten spots to put on a map where he catches bass in the summer. Unfortunately, all ten were spots I already knew about and fish often. 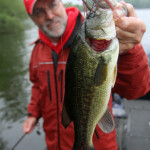 But that just shows they are good spots – when a fishing spot is good it seems a lot of fishermen find the same place. We didn’t fish much since it was so hot. I was very glad to get back in my air conditioned truck at 4:00 to head home. I would much rather fish at night this time of year. Last Sunday nine members of the Flint River Bass Club fished our July tournament at West Point, and the fishing was tough there, too. Several people stayed home because we figured the lake would be a madhouse since it was a holiday week, but the all-day rain kept most pleasure boaters off the water. We didn’t see a single skier and only a couple of skidoos all day. After fishing from 6:00 AM to 2:00 PM we brought in 34 bass weighing about 41 pounds. There were only four largemouth weighed in. Five people had limits and there was only one fisherman without a keeper. Al Rosser made it two in a row, winning with five weighing 7.02 pounds. Chuck Croft had five at 6.72 pounds for second and his 2.63 pound largemouth was big fish. Third went to Roger Morrow with five at 6.09 pounds and Don Gober’s limit weighing 5.93 pounds was good four fourth. It seems the smaller fish bite better right now at West Point and Jackson than the bigger fish. And most of the fish caught at Jackson were spots, too. They are more aggressive and feed more than largemouth in any kind of weather. The old saying “If it wasn’t for bad luck I wouldn’t have any luck at all” seems to be my motto lately. I keep shooting myself in the foot, losing bass I hook in a variety of ways. First thing that morning I had a strong fish pull off a chatter bait. That is a bad way to start the day. Then I missed a couple of hits on a topwater bait. Al fished with me and caught a keeper at about 8:00, on the next cast after I saw a spot about the same size chase my jig and pig back to the boat without hitting it. Then I hooked and lost a bass in the same place on a jig head worm. I did land one keeper from that point before we left. Then Al got another keeper off the next point we fished. A little later he got his third, then I caught a spot on a jig and pig from a brush pile. The next rocky point we fished I felt a hit and missed the strike. As I reeled in I saw a bass weighing at least five pounds chase my bait almost to the boat and turn away without hitting it. Al got two more off the next point we fished, filling his limit. A big school of fish came up and started feeding on top and Al and I had fun catching a some three pound hybrids. We kept two to eat but went back to trying to fill my limit. I got hung on a rock and as I eased the boat over to get it, shaking my rod tip trying to get it loose, a fish grabbed it and took off. I missed it but Al’s worm was right beside mine and he caught his sixth keeper. I finally got my third with just a few minutes left to fish out of a brush pile but that was it. An even worse way to start happened at 5:15. We started down the road to Pyne Park ramp but a pickup was blocking it. I called the campground and woke the manager up and he said the ramp was blocked off because of all the vandalism in the park over the weekend. Al and I got on the phone and called everyone in the tournament and changed to Horace King Ramp nearby. As we turned around in the campground, not easy in the dark with a boat, the campground manager came out and said he was moving his truck and opening the ramp, but it was too late. The least they could have done was put up a sign at the highway saying the ramp was closed! 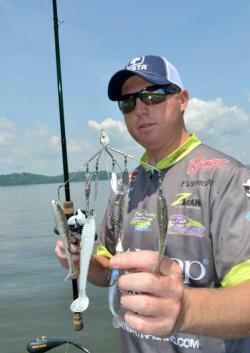 This entry was posted in Bass Fishing on July 30, 2013 by ronniegarrison. How Should I Fish an Umbrella Rig? It ain’t as easy as it looks. Though he wins plenty of money with the umbrella rig, he says he’d prefer not to throw it any more than he has to. That’s the message from FLW pro Casey Martin about flinging the notorious umbrella rig, AKA the “Alabama Rig”, on the waters of the southeastern U.S. in pursuit of tournament-winning largemouth bass. 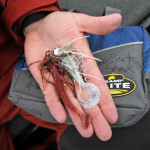 Martin said that, contrary to popular belief, he doesn’t consider the A-Rig to be primarily a winter rig, either. 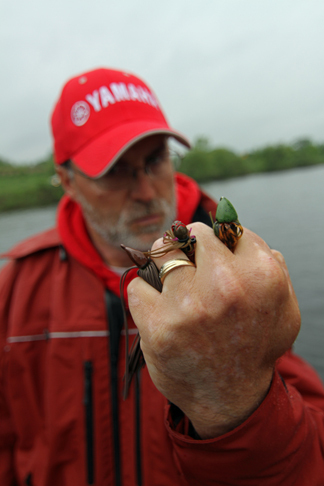 The five-armed wire rig allows creating the illusion of a baitfish school running through the water. It has proven amazingly effective on big fish in deep water. The big chore in success with the multi-lure rigs, says Martin, is studying charts and then idling along and watching your sonar. If you don’t put in your time finding the offshore areas likely to hold schools of fish, the A-Rig won’t bring you much success. Martin primarily throws the Picasso School-E-Rig Bait Ball, a five wire rig with added spinners, to which he adds jig heads from 1/8 to 3/8 ounce and shad tails 3 to 6 inches long. He fishes this where he finds a set of conditions that usually spell success. “I want to be on a hump that’s near the main channel or a deep creek drop-off, I want to see a lot of shad on the sonar, and I want some trash on the bottom, rocks or stumps or mussel shell. If you hit enough spots that look like that in 15 to 25 feet of water, you’re going to find a school of big fish sometime during the day,” says Martin. Martin says that fish of this size are a must to place well in large tournaments, and the umbrella rig is one of the easiest ways to connect with them. He said his side-scanning sonar/GPS units, two on the console and one up front, are an important part of his strategy. Martin said he lets the umbrella rig do most of the work once he heaves it out to where the fish should be. Unlike many anglers, he fishes the rigs on 25-pound-test fluorocarbon rather than on 65-pound-test braid. Casey Martin readily admits he’d rather not throw the umbrella rig ever again-but he has to if he’s going to make a living as a pro angler. 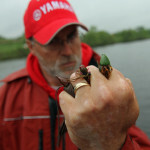 He said he does not agree with some anglers who say the extra hooks on the rig cause lasting injuries to fish, however. 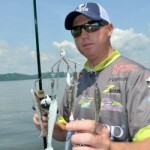 To learn more from Casey Martin, visit his website www.caseymartinfishing.com. 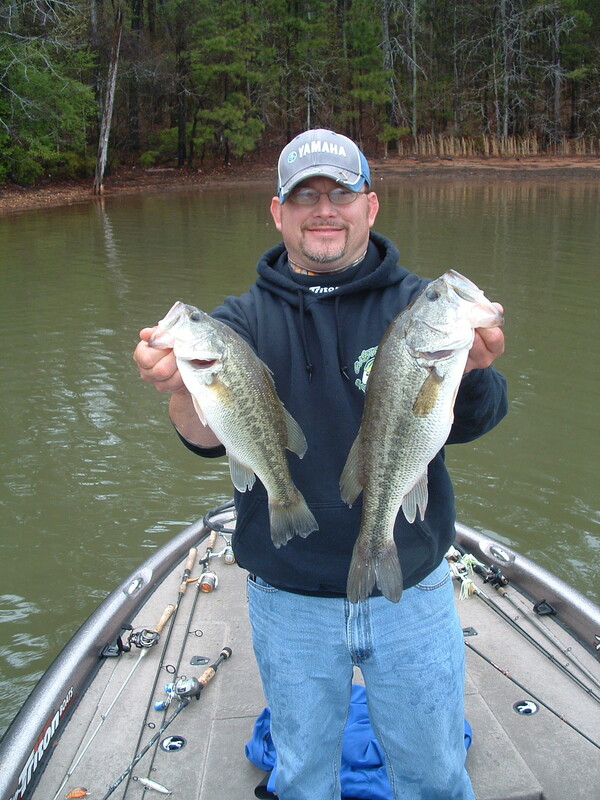 This entry was posted in Bass Fishing, How To Fish on July 29, 2013 by ronniegarrison. “The Quest and The Quarry” written by Gordon Hutchinson shares with those fortunate enough to read it a feel for growing up in the south and how important family and traditions are to southerners. Well written and easy to read, the book leaves you wishing it was longer. It is more about hunting than it is about fishing but it is an excellent book for anyone that loves the outdoors. The Quest and The Quarry was selected for an “Excellence In Craft” award from the Southeast Outdoor Press Association in 2006. Keith Sutton knows catfish and his book will help you understand them and how to catch flatheads, blues and channel cats. Kevin Dallmier was a Georgia fisheries biologist when he wrote this book. It has excellent tips on where to fish in Georgia to catch all freshwater and saltwater species in the state. It also includes profiles of fish found in Georgia. Yep, I wrote it in 2002. Lots of what I think is good information for the beginner fisherman, from tying knots to finding places to fish. This entry was posted in Book Reviews, Products on July 28, 2013 by ronniegarrison. Can I Catch Saltwater Fish By Fly Fishing? Only a handful of fishermen have attained the reputation and status of Capt. Jake Jordan in the world of saltwater fly fishing. He attained his incredible bank of knowledge by catching almost every oceanic gamefish that swims on the fly. How many people can you name who have caught salmon sharks in Alaska on a fly rod? 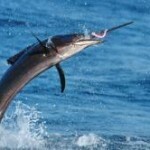 Sailfish are a perfect target for the saltwater flyrod. 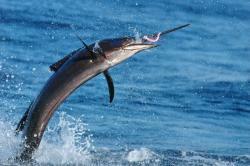 Fast and acrobatic, they readily take a fly when lured into range with teaser lures. 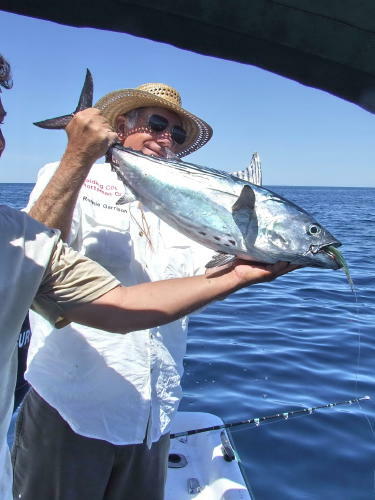 Jordan has over 40 years of experience as one of the top flats and tarpon guides in the Florida Keys. He pioneered a series of exclusive saltwater fly fishing schools for bonefish and billfish, taking small groups of anglers to exotic locales like Guatemala, the Dominican Republic and Exuma where he instructs them on how to fish for, and successfully catch, the world’s premiere gamefish with fly tackle. The remainder of the year he splits between his home in North Carolina, where he charters for red drum and false albacore during the fall, and Marathon, Fla. in the spring, where he takes charters for his first love-tarpon. His clientele fish exclusively with fly tackle and they include some of the most accomplished anglers in the world as well as newcomers who want to learn at the hands of one of the true masters of the sport. During the winter months, he is a featured speaker and presenter at the top fly fishing shows around the nation. The Yamaha team recently had a chance to sit down and talk with Jordan about what stepping up to saltwater fly fishing entails for a newcomer. When we arrived, he had just finished washing his favorite skiff, a Yamaha-powered 20′ Jones Brothers built just a few miles away from his home. The boat is aptly called the Fly Reel. Sails are capable of lightning runs and greyhounding leaps, making line handling a real challenge with fly fishing gear. Where can a neophyte go for casting instructions? There are hundreds of books and videos for sale from great fly fishermen like Joe Brooks, Lefty Kreh and Stu Apte. You can do a keyword search on YouTube® and pull up hundreds of free videos on all phases of fly fishing in saltwater. Do a search for fly fishing shows and you’ll probably find one or two good ones in your area where you can meet casting instructors, fly tiers and compare rods, reels, lines and flies from dozens of manufacturers and pick up some great deals, too. “Probably one of the best resources you can find is the International Federation of Fly FishersTM website www.fedflyfishers.org,” Jordan suggested. “They have videos, seminars, libraries, lists of casting classes held all over the country by FFF-certified instructors, youth classes, fly tying how-to and much, much more. It’s the ultimate information source and a great place to start. For more information about Capt. 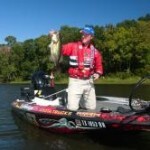 Jake Jordan, visit www.jakejordan.com and be sure to sign up for his regular fishing reports blog – it’s fascinating! This entry was posted in Saltwater Fishing on July 27, 2013 by ronniegarrison. 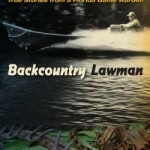 The book “Backcountry Lawman-A Unique Look Into Florida’s Wild History” is a good read. 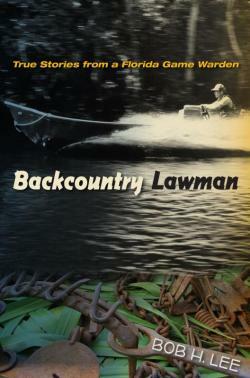 “Backcountry Lawman” recounts the adventures of Florida game warden Bob Lee during the rough-and-ready years when the state was loaded with fish and wildlife poachers. Bob Lee’s Backcountry Lawman is a fast, fun read that anyone who has spent much time in the Florida outdoors will thoroughly enjoy. Lee was a game warden with what’s now the Florida Fish & Wildlife Conservation Commission for some 30 years, at a time when the state was going from pretty much anything goes in the woods to the modern conservation ethic. Not surprisingly, as a “woods cop” he butted heads with a variety of colorful and sometimes dangerous characters including all sorts of fish and wildlife poachers along the St. Johns River, and also was challenged occasionally by the elements and the animals in a state that was still very wild. It’s an interesting look at Florida’s history from a unique perspective. The book is 250 pages long, but you may read it in one sitting if you know and love the Florida woods; there’s a confrontation and a climax in just about every chapter as Lee recalls midnight chases by boat, truck and on foot. 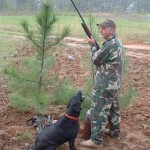 Lee is a natural story-teller and has a novelist’s eye for the telling detail, the smells and sounds and sights of the woods, rivers and lakes of northeast Florida. An interesting affection for some of the law-breakers shows through, as well-Lee obviously respects truly good woodsmen, which ever side of the law they happen to be on. And when he goes on a trail, it’s a real education for anyone who ever wants to track a deer, a hog-or a man-through the woods. Lee was so good at it he eventually became the FWC’s man-tracking instructor. The book is a nicely illustrated hard-back with black & white photos from Lee’s working era, beginning in 1977. It’s $24.95 from University Press of Florida, www.upf.com . It can also be ordered as an eBook and found in print at most brick and mortar bookstores. This entry was posted in Book Reviews, Products on July 26, 2013 by ronniegarrison. 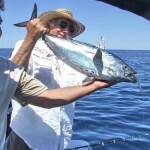 I like my Bass Pro Shops World Wide Sportsman fishing shirts like the one I wore in Baja while catching this jack. These button up shirts have big pockets, one on each side. The pockets have Velcro tabs to hold the flap closed. Sometimes the pockets are almost too big. A ball point pen can get lost in them, sideways down on the bottom. To solve this one pocket has a small opening in the flap for a pen – an important fact for an outdoor writer or tournament director! The collars are button down, too. That is extremely important when running 70 mph in a bass boat. Collars that don’t button down can beat your cheeks and jaw uncomfortably. The back of the shirts is ventilated with a mesh net the top half, covered by a flap to allow air in and heat to escape. The flap also has a Velcro patch to keep it down over the mesh, or you can loosen it to allow more air flow. The shirts are 100 percent cotton except for the mesh, which is much more comfortable to me. It seems to wick the sweat away better than most materials. The only problem is they wrinkle, so they do need to be ironed to look their best, but for most fishing I just wash and tumble damp dry and hang them up to finish drying. That reduces the wrinkles. At a price just under $25, even less on sale, they are a good value. 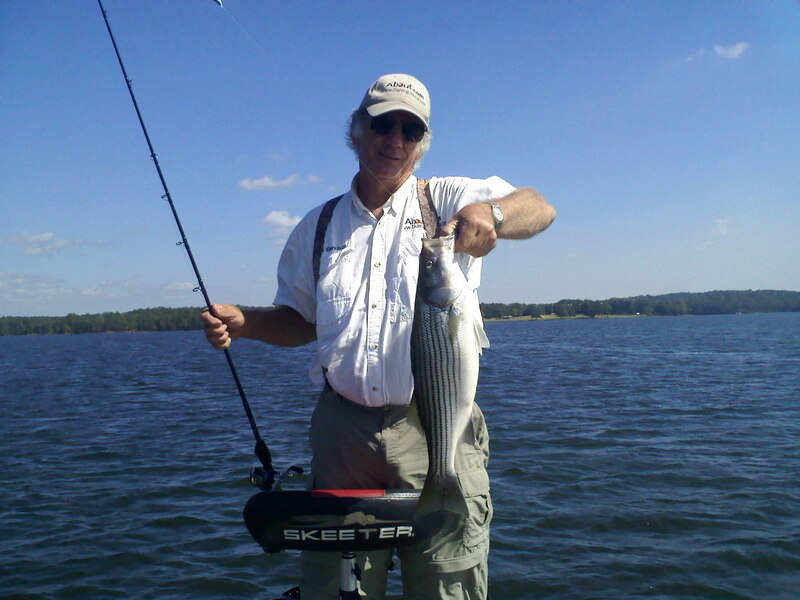 This entry was posted in Fishing Product Reviews, Products on July 26, 2013 by ronniegarrison. Dogs are special. I know of no other creature that will give you unconditional love no matter how you treat them. They will protect you, be a comfort when you feel bad and make you even happier when you are in a good mood. They are loyal to you. I have been lucky enough to have five such friends in my adult life. The only problem with dogs is they have such a short life span. You always lose them way too soon. They seem to be youthful and happy for years then suddenly they start getting old. In no time it is up to you to make sure they don’t suffer any longer. Rip was special. He showed up at my farm uninvited and stayed around the barn. I had not had a dog in my life for about ten years and really didn’t want another one since it still hurt from having to put my first two down. But Rip would run out and greet me, tail wagging and mouth smiling, every time I drove up. I tried to ignore him for a couple of weeks but he won my heart so I stopped and got food and water bowls, some dog food and a collar and headed to the farm. As always he ran out to greet me but somehow slipped and fell. I felt the back tire of my truck bump over him before I could stop. When I got out of the truck he was standing there, looking at me like “uh o -I didn’t mean for that to happen.” Then he walked a few feet and blood came out with his urine when he went to the bathroom. I was sure he would die so I didn’t even put the collar on him, but did put out some food and water. The next day I drove up and he ran out to greet me, wagging and smiling like nothing every happened. He surely didn’t blame me. After putting on his collar I drove him to Memorial Drive Vet Clinic and had him examined. We could see the tire track across his lower stomach and hip. The vet said that was about the only place you could run over a dog and not kill it, but he might still have problems. For the next ten years Rip lived at my house. He was rambunctious – I had to fence in the back yard to keep him from running off and getting in the highway, but he seemed perfectly happy. He was a mixture of lab and hound, and loved to chase and retrieve a ball. I had to hit a tennis ball with a racquet to make sure it went far enough so he would not get to it before it hit the ground. Rip never barked. He also never met a stranger. I often took him to town in the back of my truck and usually someone would be petting him when I came out of the store. You could tell he was a happy, friendly dog. The first time I got out my shotgun to kill a squirrel in the yard I was not sure what Rip would do. When I shot the gun he got excited and soon found the squirrel. In no time, if I walked out the door with a gun Rip started looking in the trees for my target. He seemed to learn to go around to the other side of a tree where I was looking for a tree rat so it would come around so I could shoot it. Although gunfire didn’t bother him at all, he was terrified of thunder. In June during a late night thunder storm on Thursday night he dug under the fence and got out. Saturday afternoon we got a call that he had been hit by a car on Highway 19 not far from our house. We took him to the emergency vet clinic in Fayetteville. We were real worried since he did not seem to know us and looked dazed. The vet treated him and said he was in shock. A few hours later we called and they said he seemed to be resting comfortably but they were worried about him since he still seemed to be dazed, but they were hopeful. Then, at about 11:00 PM, they called and said he had gone into convulsions. They felt he had brain damage and said there was less than a 25 percent chance of recovery. I could barely get the words out of my mouth to put him down. We picked up Rip’s body and brought him home. I wet the ground as I buried him under the pear tree beside Merlin and Squirt. This entry was posted in Fishing Ramblings - My Fishing Blog, Fishing With Family and Friends on July 25, 2013 by ronniegarrison. Through the end of August, you will get the chance to be entertained as sockeye salmon swim along Alaska’s Steep Creek as the adults spawn before swimming to their deaths. The Forest Service has placed the salmon cam in the creek on the Tongass National Forest so viewers world-wide have the opportunity to view fish in their natural setting. The ability to watch salmon in the wild is a treat for many people, but the underwater camera gives you a more intimate, unique look. Early in the spring sockeye fry emerge from the gravels and move into Mendenhall Lake and Mendenhall River sloughs and ponds, where they feed for 1-3 years before migrating to the ocean. 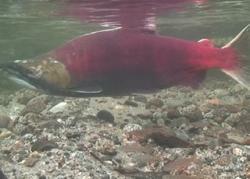 After spending several years at sea, the adult sockeye return to Steep Creek to spawn, their last act before they die. But all is not lost. The dead sockeye are still good meals for a variety of forest critters, including their own fry and as their nitrogen-rich carcasses decompose they provide valuable nutrients into the ecosystem. If you see the view clouded, it could be because a female salmon is building her redd (gravel nest) by agitating the bottom of the creek bed with her fins and tail. She then bends her body back and forth to make a depression where she deposits her eggs. A male then moves in and deposits his milt, or sperm, over the eggs after an often lengthy courtship. The female uses her tail fin to cover the redd then moves upstream to do it again. Female salmon will often build multiple redds in the same general vicinity and then guard them as long as they can before eventually dying. Sockeye salmon are held in high regard in Alaska. They are known for the high quality of their meat, bold spawning colors, unique habitat requirements and the fact that they can be tough to catch because they rarely bite on sport gear in salt water. Add all these factors together and sockeye rival king, or Chinook, salmon for the most attention. Schneider said the coho run will not be as large as the sockeye. However, more Dolly Varden char enter the stream, too. 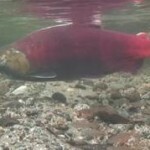 Many Dollies arrive “early” to feed on loose eggs during sockeye spawning, but many more arrive in early fall to spawn. They spawn about the same time as the coho in different locations along the creek so they do not overlap with the coho, a process refined over years of evolution. As the fish are making their way along the creek, Schneider and other Forest Service employees make daily counts. The third week of July they counted about 30 sockeye milling about in the beaver pond downstream from the camera. Surprise guests for the fish and viewers could be a black bear or two. Bears that feed on salmon are larger because they eat. A lot. And salmon provide the high calorie diets they need to gear up for the winter hibernation. “Bears will often target the female salmon for their eggs. Their keen sense of smell can detect the eggs, and I have seen them actually release a male and return to fishing for females,” Schneider said. “When salmon are plentiful, it is normal to see a carcass along the bank with only the belly eaten. The brains are also a high-calorie hotspot, even though they are smaller than a walnut. This entry was posted in Fishing Tackle on July 24, 2013 by ronniegarrison. How Can I Follow Bass From Shallow to Deep Water in the Summer? 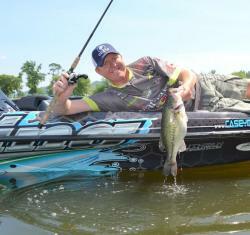 Kelly Jordan follows summer bass from shallow to deep water. 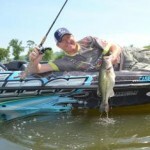 There’s a good reason tournament angler Kelly Jordon describes the hot months of summer as one of his favorite bass fishing seasons. The Yamaha Pro follows fish from shallow water to deep during the day, a technique he learned during years of guiding at Lake Fork in Texas. Jordan advises starting around brushy cover at daybreak in depths as shallow as two feet–but says fish move deeper as the sun rises. “The key to following bass in summer is fishing an area that has some type of route like an old roadbed, a tree line, or a creek channel leading from the shallows to deep water nearby,” Jordon emphasizes. “The bass move back and forth between shallow water and deep, so finding a shallow flat, a long point, or a cove that gradually falls into deeper depths is always worth trying. Jordon strongly recommends starting a July or August day of bass fishing 30 to 45 minutes before daylight because that is when fish are most likely to be in very shallow water. 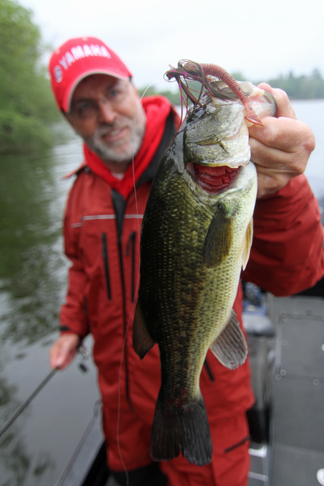 He believes these bass may be the same fish that moved shallow to feed during the night, and they’re extremely susceptible to topwater lures like buzz baits and frogs. Jordan throws a buzzbait at dawn, but often switches to a crankbait as the morning draws on. When this early, shallow water action ends, the Yamaha Pro changes to a shallow running crankbait, often a square bill model, and begins fishing slightly deeper water down to five or six feet. He may also try flipping soft plastics if the cover is thick enough, but his primary choice is the crankbait. When this bite does end, Jordon moves further out to 12- to 20-foot depths, studying his electronics to locate both steeper depth changes as well as possible schools of baitfish. 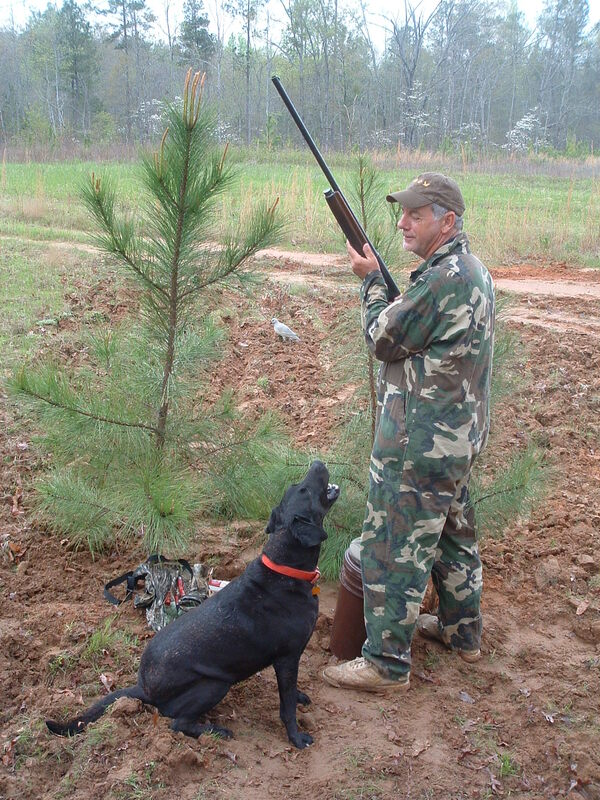 If he has found a creek channel or even a ditch leading from the shallow water toward deeper water, this is where he concentrates his search. If he’s been fishing a point, he just keeps following it further and further out in the deeper water. The Yamaha pro says fish may move up to 400 yards seeking deeper water as the sun rises, but smart anglers can learn to follow them and continue the action. “I’ll really cover this water thoroughly with a deep diving crankbait, grinding it along the bottom across any breaklines from shallow water to deep,” he explains. “Places I really look for are bends in a channel, and cover like rocks, stumps, and flooded timber. I just keep working further out into the deeper water because I know eventually I will find the fish again. Jordon emphasizes the importance of looking for baitfish, especially shad, as he moves into this deeper zone. Baitfish make this same movement, and the bass follow them. They show up on electronics because they’ll gather in large schools, and the bass will hover just below them. “Summer bass fishing doesn’t need to be a long, hot exercise in deep water crankbaiting or dragging plastic worms along the bottom,” concludes the Yamaha Pro. “As long as a fisherman is willing to start fishing early, he will nearly always find some bass in shallow water, and this can be a truly magical time to be on the water. This entry was posted in Fishing Tackle on July 23, 2013 by ronniegarrison.